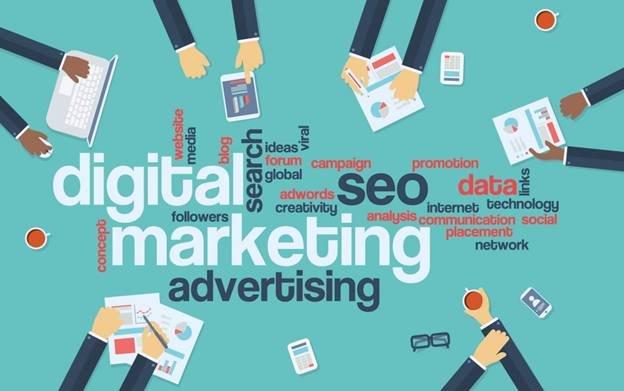 Digital marketing: As the name describes, it is the online concept of marketing business that offers a vaster platform to promote different products and services. The landscape of digital marketing is emerging at a breakneck pace where you have to put your efforts and best marketing skills to get a sufficient lead in business. If we talk about SEO, it is the collection of tools and best practices that you can use for ranking your websites higher on different search engines. SEO is related to the involvement of keywords that you can use for your website so that the various search engines can easily find it and can rank your site higher on them. But with the emerging technologies and growing on competition in the field of digital marketing, the concept of SEO also have not been remaining so simple as it seems to be before. It has been grown very sophisticated and broader these days. It is a full-time job for small businesses that need a perfectly designed website and professional marketers to support it. For more updates, you can also refer at https://www.webmarketing123.com – SEO online processes. For better digital SEO process the digital marketing plan you are going to carry out here should need to be easily readable and should also consider all the answers for questions like, who, what, how, where and different others as well. You should need to have sufficient idea and knowledge at the backup point for constructing concrete and full proof plan. We also prefer to sketch a well-functioning marketing sketch before meeting your business goals, so that you can perfectly blend them with your planning process and can execute the action plan. How to create a perfect SEO strategy? Target market: One of the best things that you can do to make your SEO more strategized and user-friendly is to target the audience for which you are going to provide your products and services. It is not always about grabbing more and more traffic towards your site, you have to work upon the thing where you can convert the potential customers into the valuable one with time. You should need to have the capability of learning about the different demographics of the market, i.e., what exactly are most of the people searching for? Once you get the specified answers for that, it will get more comfortable for you to meet that leads successfully. Mobile friendly interface: While working on a digital SEO process, you should need to create a website that you can open up on different SmartPhones as well. With the changing technology, the trend of web accessing also have been changed to a greater extent. Most of the people prefer to use their SmartPhones in place of PCs and laptops to make different types of internet accesses and streaming processes. So if you provide a mobile-friendly website to work up, the chances are higher that you will get higher traffic and ultimately higher rank on different search engines. This is the main thing where business people are looking forward to it. Be consistent: You can’t take the concept of digital SEO process as take it and forgot it. You need to be regular and active on it, so that you can get a higher rank on different search engines and maintain it later as well. Keep updating your website with the latest stuff so that you can gain the attention of viewers for a long run as well. Just make searching on the internet what currently the viewers are searching and also look forward to providing stuff according to that as well.